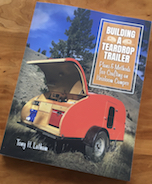 Teardrops n Tiny Travel Trailers • View topic - The "Nautilus"
New to the forum. I have been tinkering with a side profile based on the logarithmic spiral, a common shape in nature. I have attached my spreadsheet point calculator if anybody wants to give it a try. There are only 3 parameters to play with, so quite easy to adjust the profile. The start and end points will require adjusting manually to bring them back to y=0. My particular example is designed to make the most of a particular sheet size and I think is quite an attractive profile. Last edited by semm on Fri Mar 16, 2018 10:29 am, edited 1 time in total. I opened it up, but It's not showing a profile. There's a bunch of entrees with degrees, radians and then lots of "#NUMBER?" entries. Do you not see the graph with the plotted points? Image after creating a dxf from the points. I'll confess: Excel is a bit of a mystery to me. They keep updating file format versions, new software defaults to latest version old ones can't fully read, gets more people to upgrade. Save As, pick an older version file format, much more compatible. Spreadsheet has also been attached in an older format. Fun to play with! Thanks!